Canal Cottage A | Best Vacation Rental to stay in Kauai. Like Canal Cottage B, Canal Cottage A is for Kauai bound couples on a budget. This vacation rental, however, boasts a fully equipped kitchenette, making it more suited to stays of a week or longer. It also offers views of the river, which add to the serenity and charm of this delightful vacation home. This unit does not have an A/C but we have other units available that have A/C. 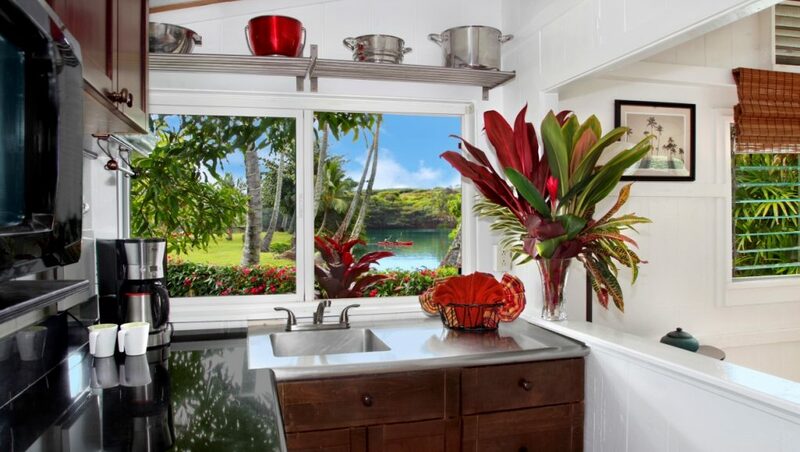 Originally constructed in 1953, Canal Cottage A has all the charm and luxury you would expect from a Kauai vacation rental. The spacious, open-design vacation cottage boasts a queen-size bed, tropical wood accents, and a ceiling fan but no A/C. You can view the nearby river from the main room and the kitchenette, and the location ensures a strong cross-breeze with no need for air conditioning. There is also a small patio area in the garden just outside the front door—perfect for dining alfresco while enjoying the view. This studio is ideal for stays of a week or more. If you need to stock the kitchenette, you’ll find several of Kapaa’s markets less than a five-minute drive from Fern Grotto Inn. and a one-time cleaning fee of $120 plus tax of 14.962%. Full payment comes due at time of booking. Payment may be made by e-check or check. Credit Card payments will incur a 3% charge. Book today while this vacation rental cottage is still available! There were four of us staying in the Ohana House. We stayed for seven amazing nights. The house is charming, a nice change from the usual accomodations in a hotel. The thoughtful touches in the house were great. We all enjoyed the history of the beautiful property. The short walk to the beach was worth it. We all loved the house. It was difficult to leave and we are already talking of returning. Thank you so much. My wife, son and I had a fantastic stay at Fern Grotto's Ohana house, it really has it all. We found the accommodations very comfortable, nicely located with a home from home feel plus. The people who own and manage the property were extremely helpful I would definitely stay here again. Its a quite and beautiful property, which has many amenities. Very spacious, clean, comfortable cottage. Has everything one would need for their stay. Beautiful grounds that are secluded from the hustle and bustle. Every need is addressed by the owner quickly and graciously. Would return in a heartbeat. It was a wonderful stay. We stayed at the Garden Cottage and enjoyed the space and the amenities. Great sheets, bed, towels and almost everything we needed. Access to kayaks and bikes were great and the cottage has a great view of the river. Paul was great and very gracious. The location is a little close to the main highway and a busy road but if you close up at night and run the air conditioner you never hear the road or roosters! I can't say enough good things about the owner, and the inn - what a gem! The rooms are all as clean and well-decorated as the photos show, and the grounds are beautiful. It is so well located, just a short walk to the beach or the boat launch for kayaking down the river. The owner was a complete sweetheart. I would return in a heartbeat. The Fern Grotto was the perfect place to stay for our trip! If you like having all the accouterments of home - then this is the place! I've stayed in plenty of hotels and it's nice to simply have your own 'home-away-from-home' and not pay resort fees or tip people when you want something simple. The rates are very reasonable - and Paul was excellent at upfront communication! The location was great for what we wanted to do. I'm not sure if the east shore has as much going on as other areas, but for us it was great- we spent one day going north, one day south, one day west, etc. Kapaa seemed to be pretty centrally located for all that. Paul, the owner, is very friendly and provides coolers, beach chairs, snorkel gear, and more for you to borrow on your excursions. Fern Grotto Inn is an excellent choice for lodging on Kaua'i if you're looking for a place that is: quiet, clean. well equipped (functional kitchen for preparing breakfasts/lunches; DVD/TV; swim/snorkel gear, washer/dryer (free), bbq grills), well maintained, centrally located. The owners are very very nice and quite helpful. The price is comparable to hotels offering much less. Paul the owner is great, very friendly and laid back. He's there if you need him, otherwise you have total privacy. He took my daughter and I around the property on a couple fruit picking trips and we tried lots of new things. He gave me great choices and directions for dining. We used the phone, the laundry machines, and the shared items like lawn chairs, boogie boards, etc. We just loved having a little house to call home and use as a base. The location is so central to the entire island. Find out how much it will cost to stay?